Designated as an Important Cultural Property, the main shrine building contains five shrines together: a lower shrine, a middle shrine, an upper shrine and auxiliary shrines Tanaka Shrine and Shino Okami Shrine. 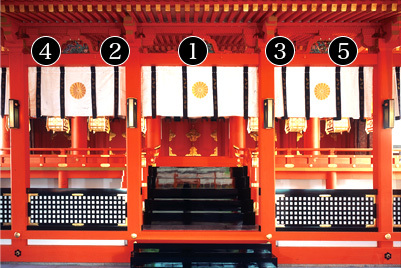 These five pillars of Fushimi Inari Taisha are named for the great virtues of Inari Okami that they embody. ＊You can find each part of the main shrine building on the map. “Inari” is short for “Ine nari” or “Ine ni naru” (reaping of rice). It is a word from ancient Japanese in which rice, the main food sustaining Japanese people’s lives, symbolizes the miracles of heaven and earth. “Inari” was originally written in different characters that have a different meaning, including in the surviving parts of Yamashirokoku Fudoki, an ancient report on provincial culture, geography and oral tradition that was completed around 713 and presented to the emperor. The current spelling of “Inari” was first seen in an imperial decree from Emperor Junna in 827, recorded in the historical text Ruiju Kokushi. However, some content in a text written in the fifth month of 713 suggests that the current spelling of “Inari” was already being used by the time Fushimi Inari Taisha was described in Yamashirokoku Fudoki and that the old spelling was only used there because the text followed the writing conventions of older historical records. It has been mentioned in works such as Kagero Nikki (The Gossamer Years) by Michitsuna no Haha, the first diary-based work by a female writer, as well as Makura no Soshi (The Pillow Book) by Sei Shonagon and writings by Izumi Shikibu. It is clear from these works that Inariyama has long been a sacred mountain for ordinary people. Today, Inari Okami is known as a deity of business prosperity, prosperity of industries, safety of households, safety in traffic and improvement in the performing arts. People throughout Japan pray to Inari Okami for these things, and Inari Okami’s reach has now spread beyond the shores of Japan to distant lands.